Funding for the Future – Making sure that appropriate funds and tools are available to operate efficiently and work regionally in order to succeed globally. Michigan in Motion – Shifting from near exclusive vehicular-based investment to alternative modes of transportation that will accommodate all users, i.e. pedestrians, bikers, public transit riders, and drivers. 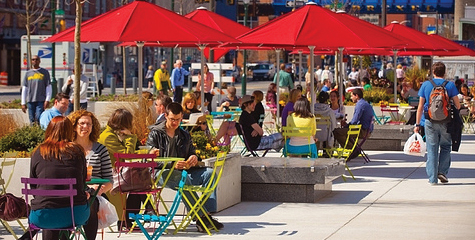 Place for Talent - Partnering with the State to attract and retain talented workers in our communities through placemaking policies. Strength in Structure – Seeking out solutions to invest in infrastructure and development where it will produce the best results and target resources with maximum outcomes. We can depict our policy proposals in the same manner, giving a visual depiction of how critical and essential it is to obtain the basic policy changes in order for communities to be able to move to the higher “levels” to reach the point of being fully sustainable places. 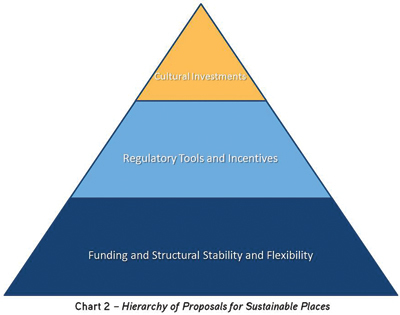 The policy recommendations can be placed into a triangle of their own—a Hierarchy of Proposals for Sustainable Places. The League’s Policy Agenda is a mix of core solutions that build on each other. Taken as a whole, they would put Michigan’s communities in a competitive position as we move ahead in the 21st century, creating sustainable places that attract talent and prepare them to flourish in the knowledge economy.